The art of resistance. – Leigh Reyes. My Life As a Verb. 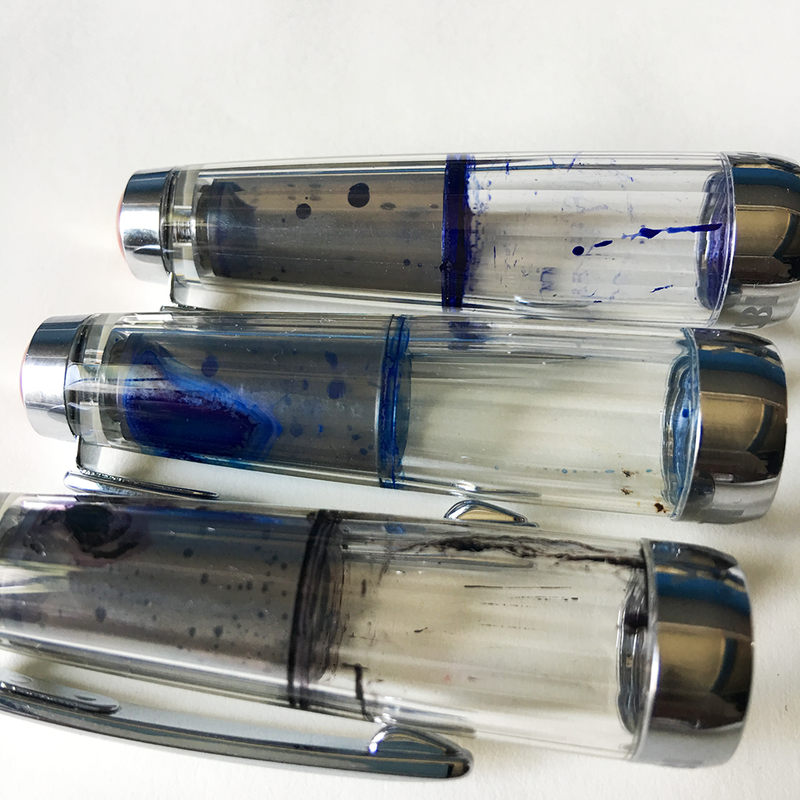 Most fountain pen inks aren’t water-resistant. Unless you have a habit of spilling coffee on your notes, you normally wouldn’t mind. 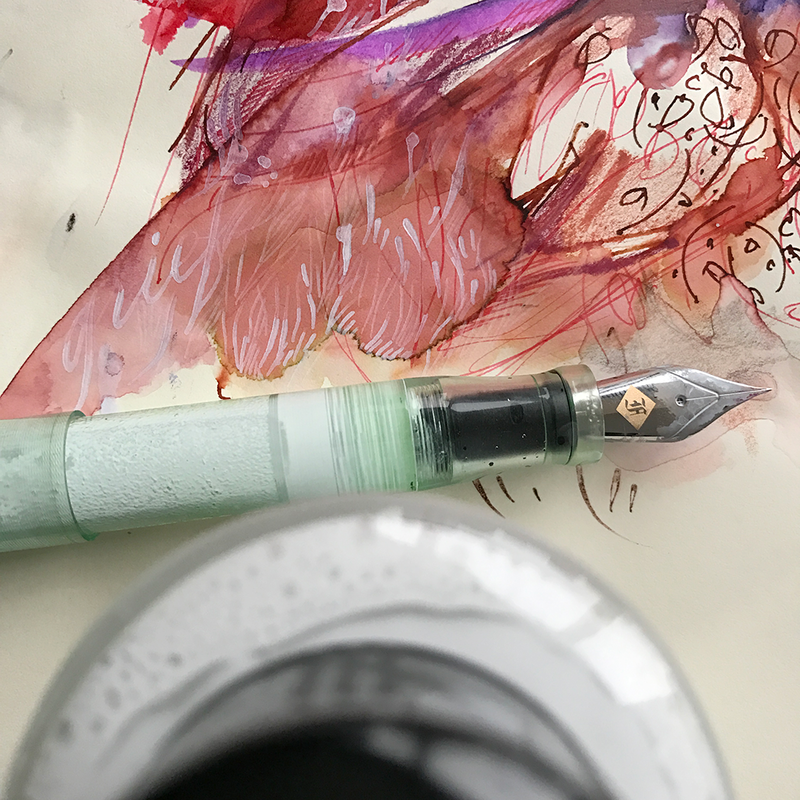 It’s for a good reason: modern pens, with finned plastic feeds and relatively tight tolerances between feed and nib, need inks that flow easily. What can make an ink water-resistant or waterproof can inhibit flow, stain a pen, and even potentially corrode weaker nib material. Official documents in many parts of the world still require handwritten signatures, and for those who prefer the added weight of tradition and ritual that comes with fountain pens, waterproof and archival inks continue to be manufactured. Among those inks that come easily to mind are Diamine Registrar’s Ink, Rohrer & Klingner Salix, and Pilot Blue Black (water-resistant). Honestly, though, I need a meteorite to obliterate my entire collection before I give up my death grip on Platinum Carbon Black. In a needlepoint or a brush pen, it is the best drawing ink ever. 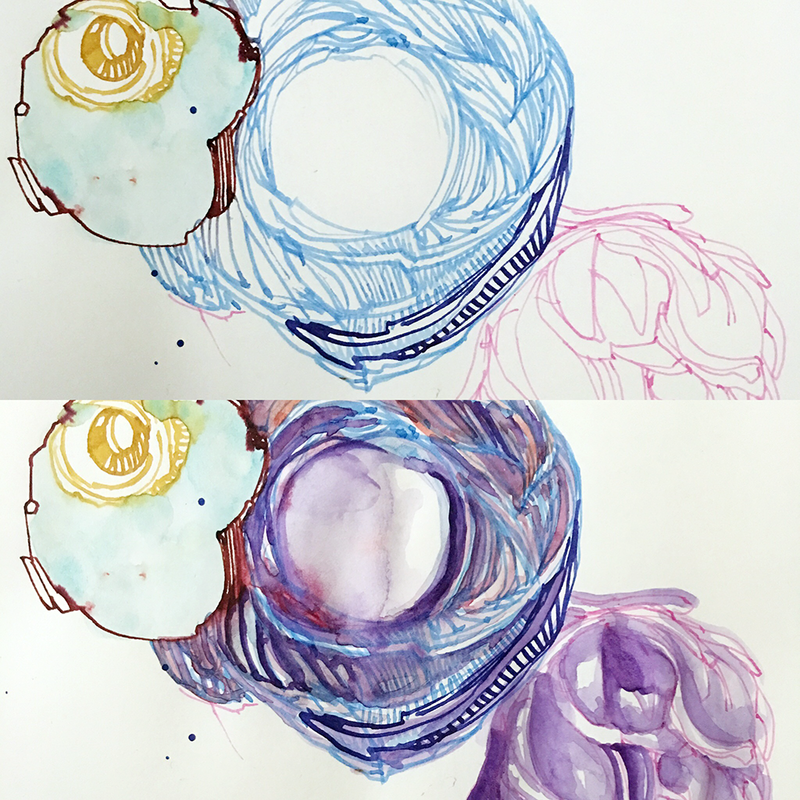 It takes a touch long to dry, but once it sets, it will not budge, no matter how many washes of watercolor I overlay. My wardrobe might have morphed into inoffensive semi-casual, but my inner younger Goth finds joy in the blackest, non-budge-iest ink of them all. Someone once said that steampunk was Goth, only brown, and I do have my steampunk moments. So it was inevitable that my wandering eye would turn towards other waterproof inks. I don’t only use them for outlines in drawings, but as preliminary washes. Fortunately, ink manufacturers have been innovating in this area, and we now have more choice than ever before. I already know that I shouldn’t leave Platinum Carbon Black too long in any pen. Unused for a week, the pen will be a hard starter; unused for two, the feed will already be clogged. I just swirl the nib in water during use, to keep the pigment particles from accumulating in the feed over time. 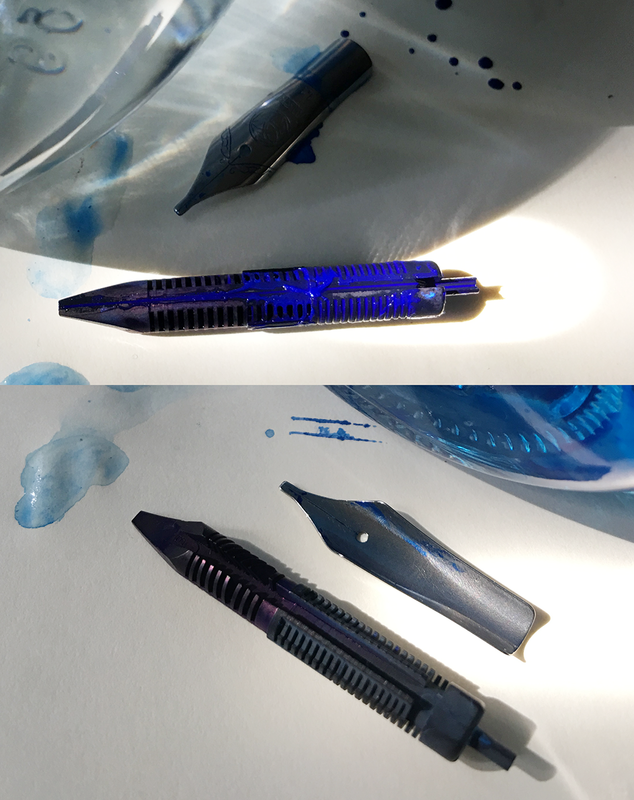 If you inspect the Platinum Carbon desk fountain pen, you’ll notice the feed has no fins. So I bought sacrificial TWSBIs to see how De Atramentis Document Inks and Rohrer & Klingner Dokumentus would fare. Both are marketed as safe for archival use, recommended for official and legal documents that need to stand the test of time. 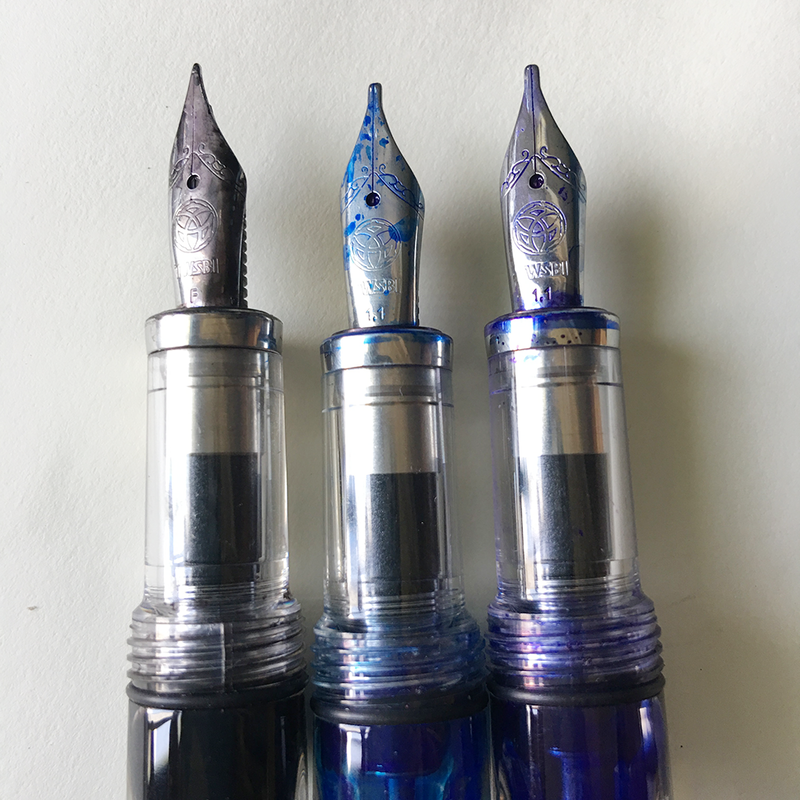 The first three Vac Minis have had Dokumentus inks in them since last May 2016 (over 6 months). The 4th is a recent fill of Dokumentus Black. The Orange Al is a recent fill of Dokumentus Brown. Waterproof inks tend to be tenacious. Not sludgy, but they will insist on sinking into every nook and cranny. The inner caps can be removed, and the insides cleaned thoroughly. Anyway, they all eventually write, after some coaxing. (Coaxing includes priming the nib, plus a quick dip in water.) I think they will all leave some kind of residue in the feed if the pen isn’t used. The image below shows what happens to the feed after 6 months. (Surely you won’t ink a pen then not use it for half a year, right?) The residue rinsed away easily enough. But what is this sacrifice in the service of? The emotion of an drawing can be subtle, but precise. So much happens in the interplay among texture, color, and line. Our eyes are used to black outlines; these lines contain the shapes we’re trained to see. However, change the color of the outline and the impression changes. It’s no longer a shortcut. 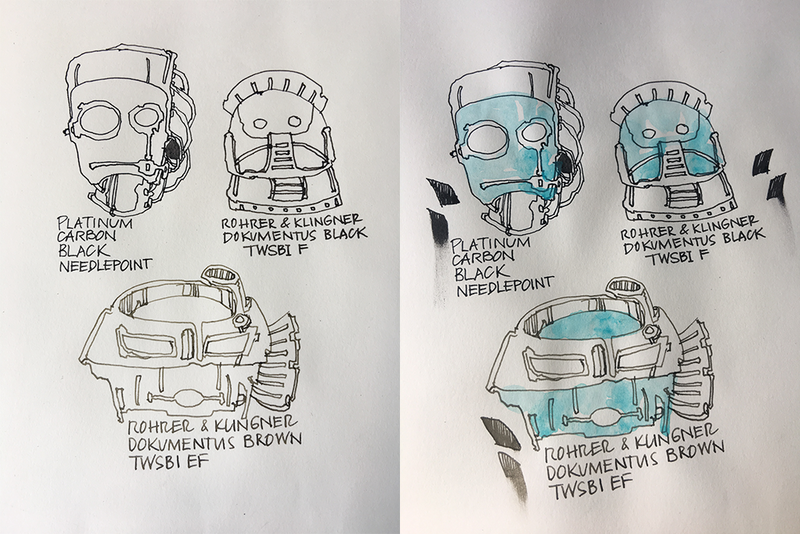 Water-resistant inks in different colors allow us to see our drawings in a different light. Dark brown just feels – more rustic, less tame. Light blue feels ethereal. This is Dokumentus Light Blue in a 1.1 mm nib, followed immediately by watercolor. 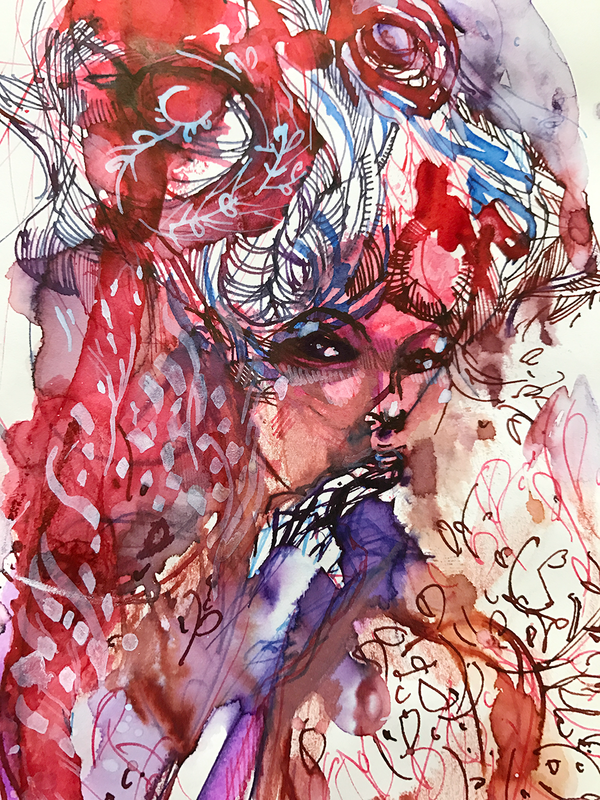 You can also use pigment inks as a wash or semi-opaque layer. This is Platinum pigment ink in Rose. Unlike Platinum Carbon Black, this isn’t lightfast. But it resists multiple layers of ink applied on top. I’ll tackle iron gall inks like the ones from KWZ in another post. They all dry dark, no matter how bright they begin on the page, so they don’t work the same way for illustrations. However, if all you’re after is a signature that succeeding generations will still find legible, iron gall inks are hard to beat. 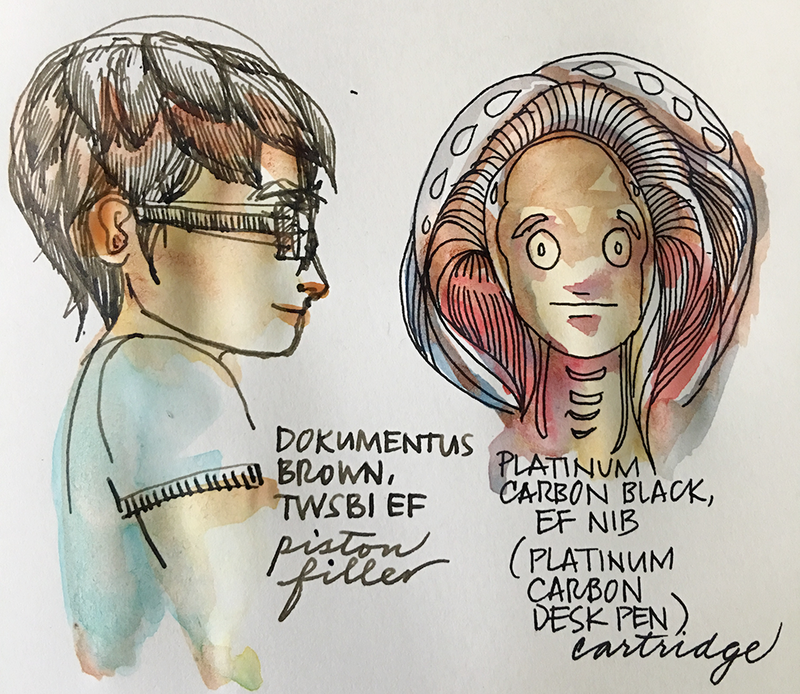 DE ATRAMENTIS – wide selection, you can buy a dilution fluid in large bottles (heaven knows why, these inks spread on paper way too much, transforming F nibs into Ms). Because of the way these inks spread, I don’t recommend them for finely-controlled drawing. They’ll work for juicy, broad strokes and washes. I like Blue-Grey, Violet, and White. 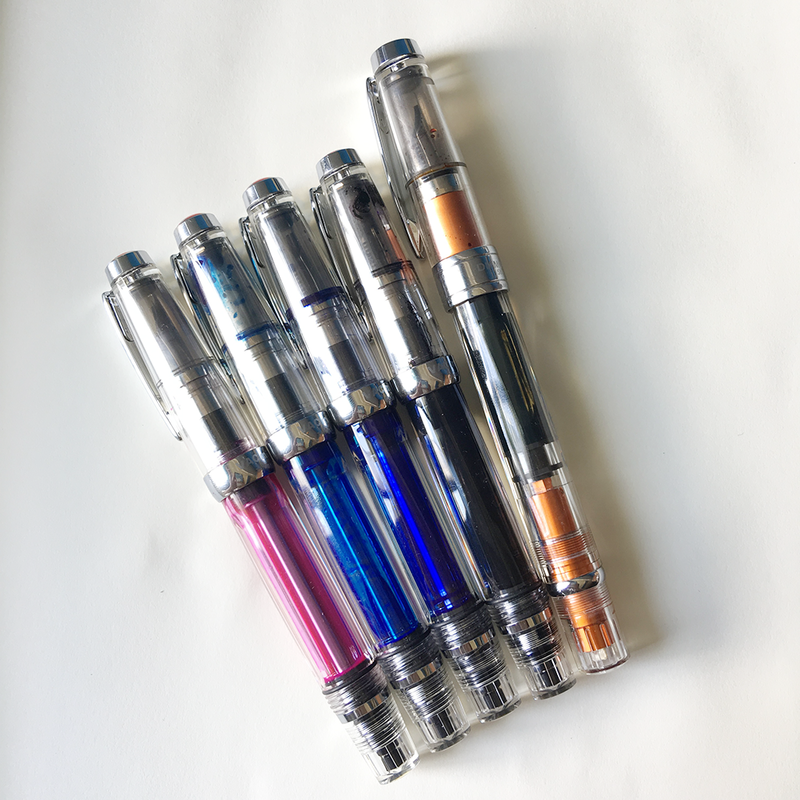 SAILOR STORIA – my absolute favorite for drawing, especially in extra fine and needlepoint nibs. They tend to write dry in medium and up, so will not be as friendly to note-takers and scribblers and letter writers. (Letter doodlers will do just fine.) Lion (Light Brown) is lovely for landscapes, people sketches, animals. Clown (Yellow Green) for botanicals. Dancer (Pink) for people sketches. Magic (Purple) for rock formations, architectural sketches. The others are just okay. These four are the standouts. I really, really want you to try these inks, so I made a video.